This course equips students with the knowledge and skills they need to make healthy choices now and lead healthy, active lives in the future. Through participation in a wide range of physical activities, students develop knowledge and skills related to movement competence and personal fitness that provide a foundation for active living. Students also acquire an understanding of the factors and skills that contribute to healthy development and learn how their own well-being is affected by, and affects, the world around them. Students build their sense of self, learn to interact positively with others, and develop their ability to think critically and creatively. In this unit, students will learn about the different aspects of fitness and how to integrate them into an exercise plan (minimum four weeks) that will lead to active and healthy living. Students will also learn how to use attributes, such as motivation and visualization, to help them achieve their health and fitness goals. In this unit, students will learn how to integrate healthy eating habits into their lives. Through the creation of a food plan (minimum four weeks), students will create healthy eating goals that will challenge their current conceptions of a healthy diet. Students will learn how to identify factors that influence their decisions about what to eat and understand that careful planning can help lead to a healthy lifestyle. In this unit, students will focus on their mental well-being with an emphasis on exploring mindfulness. Using a combination of physical activities and mindfulness techniques, students will learn about factors that tie emotional and mental well-being to their physical health. 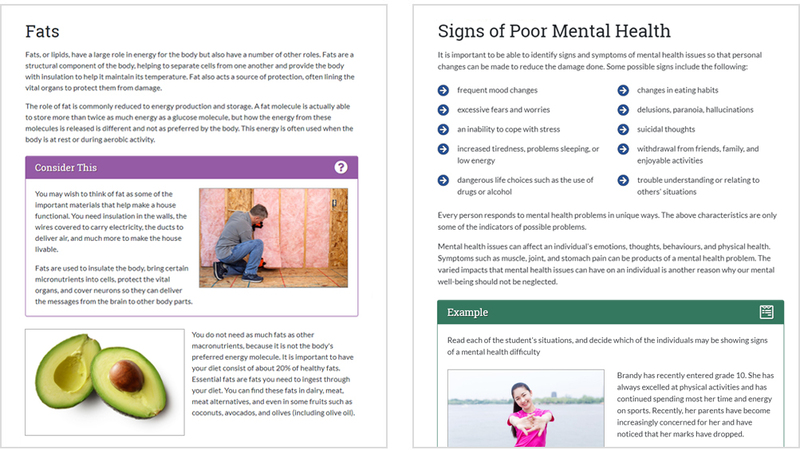 Through the use of case studies and self-reflection, students will learn how to identify issues with mental health and the appropriate responses. In this unit, students will explore the different safety considerations for both the individual and others. Whether it is being proactive by undergoing a proper warm-up to ensure your body is ready for physical activity or learning how to perform CPR in an emergency, this unit will examine how we can be safe while being active. In this unit, students will explore three different games and activities that they can participate in on their own. The unit will focus on the principles of participation, movement skill development, activity-specific skill execution, and the different strategies required to be successful and increase the student's overall enjoyment. In this unit, students will explore three different games and activities that they can participate in as part of a group. The unit will focus on the principles of participation, activity-specific skill execution, and the different strategies required to be successful and increase the student's overall enjoyment. In this unit, students will learn that environmental and social risk factors can affect their mental and physical well-being. Students will reflect on how the decisions they make impact their lives while learning how to remain resilient in the face of adversity. The unit focuses on building healthy relationships and making good decisions based on the core values of the student to promote healthy and active living. The final project challenges students to apply the fundamental concepts of healthy and active living to their lives through a fun and engaging project. There is a final proctored exam worth 15% of the final grade. Note: This course is entirely online and does not require or rely on any textbook. All recommended resources are intended to guide a student toward the items they may want to utilize throughout the course. It should be noted that failure to obtain the recommended items will not prevent a student from completing the course. Students are provided options at all assessment points and can complete the course without investing in speciality items. Plan, create, and execute a healthy eating and fitness plan to last a minimum duration of four weeks. The student can execute both the healthy eating and fitness plan concurrently. Students should be advised that they require a minimum of four weeks to complete the course. A3 demonstrate responsibility for their own safety and the safety of others as they participate in physical activities. B2 apply movement strategies appropriately, demonstrating an understanding of the components of a variety of physical activities, in order to enhance their ability to participate successfully in those activities. C3 demonstrate the ability to make connections that relate to health and well-being – how their choices and behaviours affect both themselves and others, and how factors in the world around them affect their own and others’ health and well-being. Differentiated Learning and Assessment: This course allows students the flexibility to not only work through the course in the order they are most comfortable with, but also lets them select options for assessments that best fit their respective skill sets and comfort levels. The goal is to allow the student to demonstrate their understanding and ability through a variety of assessment opportunities. Technology and Media Strategies: Activity-specific skills and strategies are supported by video instruction. This allows students to see the movements prior to participation. Thinking Skills Strategies: Through the use of case studies and self-reflection, students will learn to think creatively and critically about issues involving healthy and active living. Accommodations (instructional, environmental or assessment) allow the student with special education needs access to the curriculum without changes to the course curriculum expectations. VHS will develop a Personal Education Plan (PEP) based on the student’s existing Individual Education Plan. The most effective way to enable all students to learn about healthy and respectful relationships is through the school curriculum. Virtual High School teachers can promote this learning in a variety of ways. For example, they can help students develop and practise the skills they need for building healthy relationships by giving them opportunities to apply critical-thinking and problem solving strategies and to address issues through group discussions, role play, case study analysis, and other means. Virtual High School can also have a positive influence on students by modelling the behaviours, values, and skills that are needed to develop and sustain healthy relationships, and by taking advantage of “teachable moments” to address immediate relationship issues that may arise among students.